The (re)settlement of North America, first from Europe, and now all points of the globe, has given rise to complex interactions between Indigenous peoples and colonizers; all of these interactions have taken place on and through landscapes which are themselves complex places of human and non-human relationship. However effective European settlers have been at displacing Indigenous territory holders, a longer term accommodation between settler and Indigenous societies, and indeed between settler activity and the ecology on which we all depend, has yet to emerge. The researchers clustered here are loosely focussed on the many and varied ways in which settlers have fit into Turtle Island (North America), how Indigenous peoples have adapted to settlers, and how both struggle to live successfully on the lands they now cohabit. Specific topics include regional/alternative food systems, decolonization, and emerging models of Indigeneity. These topics necessarily engage both Indigenous and settler researchers (some community based, some university based, but all working in the context of community) in an ongoing dialogue and learning process about how we can live well here (wherever here is), now, and into the future. 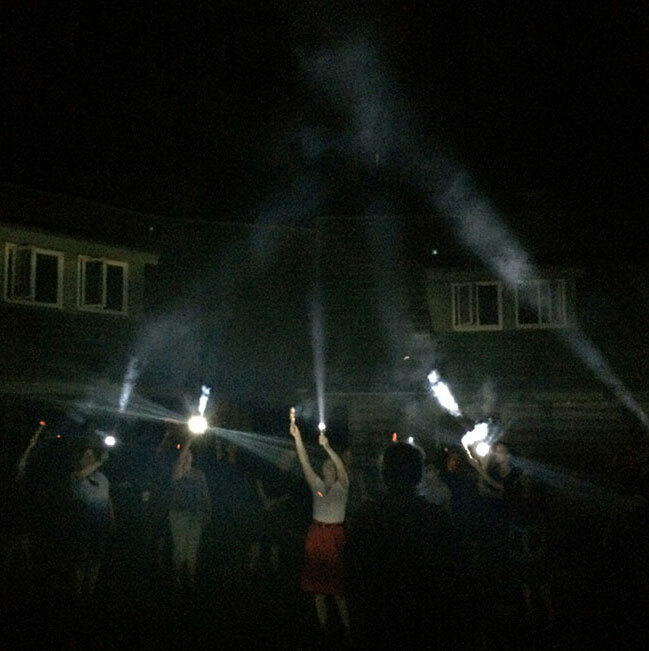 Cheryl L’Hirondelle uses burning sage and flashlights to create a “light teepee” at the Woodhaven Eco Centre as part of the Indigenous Activist Art summer intensive, 2014, a UBCO initiative led by ICER members Stephen Foster and Ashok Mathur. Alex Janvier, Elder and member of the Aboriginal Group of Seven, talks to Jeannette Armstrong and Joseph Sanchez.